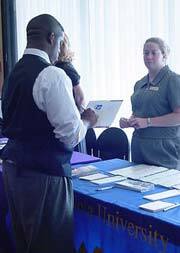 To provide delegates attending Buckeye Boys State program with an opportunity to explore educational options available to them by a wide range of educational avenues and facilities, the American Legion Buckeye Boys State program conducts an annual "College Fair". 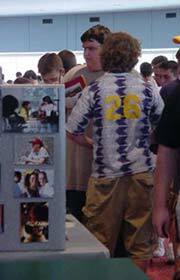 The Buckeye Boys State College Fair invites to the Boys State program representatives from Universities, Colleges, Service Academies, ROTC Detachments, and all branches of the U.S. Armed Forces from thru-out Ohio, the Midwest, and a wide geographic region. 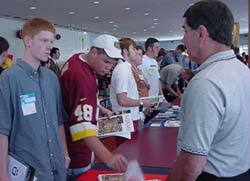 Annually, nearly 100 representatives from the above named facilities have information tables and information booths at the Boys State College Fair. 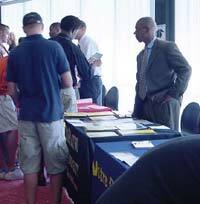 The Buckeye Boys State College Fair provides an informal environment for Boys State delegates to talk "one on one" with educational representatives from facilities of their choice.